Wild Rice, I personally never had it before, I am used to basmati, regular rice, all cooked, but wild rice and raw.... the first time I saw it was when I bought it from the grocery shop. I went to TAU on st Denis, a health food store, everything you find is organic. Mix all ingredients in a bowl. This recipe is perfect for introducing people to raw cuisine. 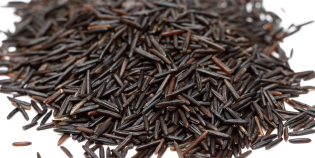 ** For this recipe, as well as with all the wild rice recipes, you will have to soak the wild rice overnight in advance.